This year the Stills Cyclone24 at the Wales National Velodrome is being supported by the wonderful team at PhysioSpace. Based in Penylan, Cardiff, Physio Space provide the very best in Physiotherapy, Rehabilitation, Podiatry, Sports Massage & Fitness. 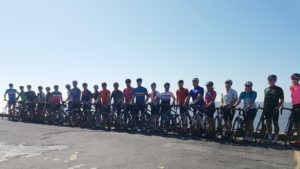 Ed and his team will be supporting the riders in this years Welsh challenge and here he gives us some top tips on how to prepare for the challenge ahead. With Cyclone24 fast approaching, you’re probably wondering how you’ll juggle a busy work schedule with family commitments and a hectic pre event training programme. Before any cycling challenge it is essential to physically prepare for the demands your body will have to deal with on the day. Training smart is key. Establishing your training zones is an important step in creating a structured training plan which delivers time efficient and effective training, enabling you to achieve your goals. However just focusing on the aerobic component of your training is not sufficient. Another essential aspect to training smart is strength work. The beneﬁts of strength & conditioning in multidirectional sports is widely accepted. 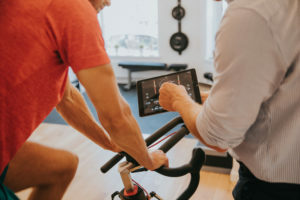 Whereas those who participate in endurance sports, such as cycling, often overlook its usefulness in improving performance and in injury prevention. Strength training is an essential component of any elite or amateur athlete’s performance programme. Cyclists included. Cycling requires strength in order to turn the pedals faster than the person next to you, even more so when competing on the track. The stronger the cyclist, the easier it is for him or her to turn the pedals with force, therefore training strength is a cornerstone of performance. Research suggests that improvements in performance are mainly associated with increases in lactate threshold and leg strength. Lactate threshold is deﬁned as the intensity of exercise at which lactate begins to accumulate in the blood at a faster rate than it can be removed. The higher a cyclist’s lactate threshold, the longer he or she can sustain a high level of effort without fatiguing – i.e. cycling harder for longer. Power output is widely referenced in cycling literature. To increase strength, and therefore power, you must overload speciﬁc muscle groups with heavy weights and low reps. The exercises outlined below should be performed with weight/resistance (dumbbells or barbell), 3 – 4 times per week, 6-8 reps x 4 sets. At PhysioSpace we use our Wattbike Pro to test aerobic capacity and set training zones. We use a force plate to test explosive leg power and measure limb symmetry with a battery of jump tests. We combine the objective data we gather with our clinical expertise to formulate well structured, personalised training programmes for all clients.